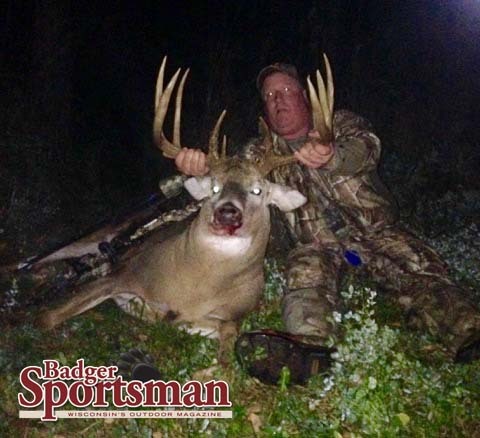 Gary Christian shot this buck in Waupaca County, Wisconsin on October 21, 2016. It scored 177 5/8 inches. Gary Christian set off on a late October hunt looking for a buck and he got to encounter two nice ones, but only one stayed in the woods. On October 21, Gary set off with his video camera and bow and was able to grunt in this monster buck. It was accompanied by a large 10 pointer as well, but Gary picked out the bigger one and took a shot. The 13 point buck was shot in Waupaca County, Wisconsin and scored 177 5/8. It weighed 215 pounds field dressed and 265 before. This is Gary’s best buck ever. Congratulations to Gary on a fine deer. Make sure to send us your big buck photos and check out our other big buck pictures.